Topics involving gut health and the microbiome have been extremely hot topics in the health and wellness space. People are reaching for kimchi and kraut for beneficial ways to live healthy, all while supporting their gut — which in turn supports the immune system! The good bacteria living and lining our gastrointestinal tract helps protect us from pathogenic factors resulting in salmonella or E. Coli, among many other things, so support your gut with the naturally-occuring bacteria that come from fermented foods. Let’s clear up a myth real quickly: pickled foods are not fermented and do not contain the beneficial probiotics that fermented foods do. Foods that are pickled are shelf stable and have been preserved in an acidic medium, while fermented foods create their own acidic medium while they are fermenting. It’s the fermentation process that produces the beneficial bacteria, so when you’re at the grocery store, double-check that it is indeed fermented! A big clue that it’s pickled is that vinegar is one of the ingredients. Fermentation is a process that produces beer and wine, in addition to bread and cheese. It’s a chemical reaction that cultures have been implementing for centuries, resulting in the delicious foods we eat today. Not only are these foods delicious, but they’re greatly beneficial for our health. Why is fermentation so great? It’s beneficial in that it aids in digestion and the bioavailability of nutrients in our bodies, as well as immune health and inflammation balance. Alcoholic – This type of fermentation occurs in glucose metabolism, when pyruvate is broken down to carbon dioxide and ethanol by bacteria. This is used in beer, bread, and wine making. Lactic acid – When pyruvate is broken down via glucose glycolysis, it can then be further fermented to lactic acid. Both of these processes result in bacteria that aids establishing and maintaining healthy gut flora. Keep in mind there are well over a dozen of beneficial probiotic strains, such as Lactobacillus acidophilus DDS-1 and Lactobacillus plantarum. Each fermented food will contain different strains that support different things. For example, Lactobacillus acidophilus DDS-1, supports a healthy bacteria balance and immune function. Lactobacillus plantarum is found abundantly in kimchi, and survives and with stands your stomach’s acidic environment that makes it invaluable. Better digestion – Fermentation breaks down foods and their nutrients to more easily digested compounds. When Lactobacili — a highly abundant probiotic — multiplies in fermented foods, it increases their vitamin levels, in addition to their bioavailability. For example, dairy products are difficult for some people to digest, but in fermented dairy products the lactose can be converted into lactic acid, making it better tolerated. Fermented foods can help with arthritis symptoms, reduce symptoms of lactose intolerance, enhance the bioavailability of nutrients, and support the suppression of H.pylori. Kimchi – Kimchi is spicy fermented vegetable blend from Korea. This savory, fermented treat boasts high mineral, vitamin, and fiber contents — in addition to the naturally occurring probiotics. Kombucha – Kombucha has led to a cult following with this fermented drink. This beverage can be enjoyed as a sour tonic that is slightly sweet. Kefir – Kefir is a fermented dairy product, as a result of lactic acid fermentation. The fermentation comes from kefir grains, which are naturally balanced in lactic acid yeast and bacteria. 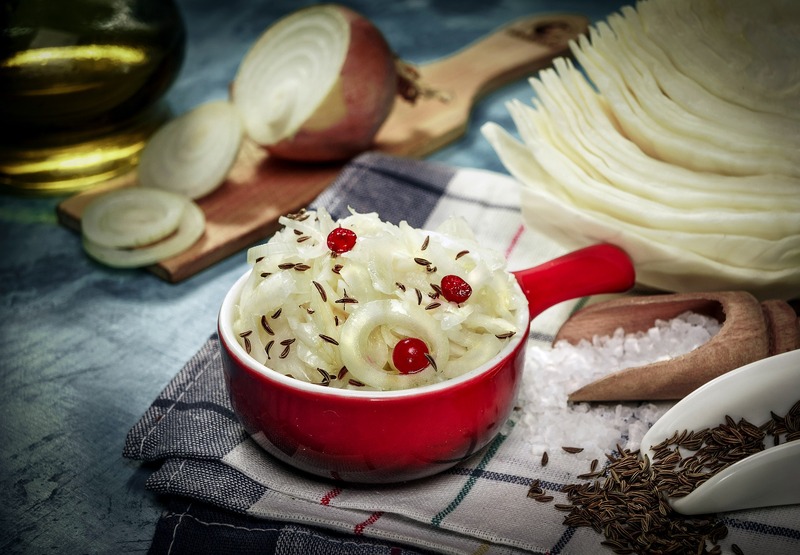 Sauerkraut – Sauerkraut is cabbage fermented through the lactic acid process of fermentation. It has been modernized quite a bit, so it’s not your typical German side dish anymore! Find it fermented with calendula, radicchio, and beets. 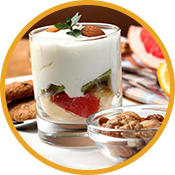 Yogurt – Yogurt is probably the most popularly marketed for its cultured benefits, but it is a nutritional power-house! It has probiotics, calcium, and protein. Natto – Natto is fermented soy rich in Bacillus subtilis, made popular in Japan. The enzyme produced in natto is nattokinase, and is a natural blood thinner. Cut your cabbage into quarters (or have your produce department do it). Place two quarters in a large mixing bowl and sprinkle one tablespoon of salt over it. Begin to massage and work the cabbage, as the salt tenderizes and pulls the moisture from it (this is the crucial step, so be sure to get a good amount of liquid from the cabbage). Mix the other ingredients and seasonings in. Take the cabbage and place it into a clean mason jar. Pack the cabbage as tightly as possible. Pour the cabbage brine on top, so the cabbage is completely submerged. Repeat the above steps for the second half of your cabbage. Let it sit and rest on your counter for up to two weeks. If the lid begins to swell, open the jar and give it a little burp, and then reseal it. Once the two weeks are up, store it in the refrigerator. Bifidobacterium longum BB536 – This probiotic supports the immune system, while suppressing harmful, intestinal pathogens. It establishes and helps colonize beneficial bacteria, and can be used in diarrhea prevention. Protease (from Aspergillus Niger and A. oryzae) – This enzyme aids in dairy digestion. Lactase – This enzyme aids in the digestion of lactose found in dairy products. Lipase – This enzymes aids in fat digestion. Try DIGESTSolve 24/7 today for better digestion!